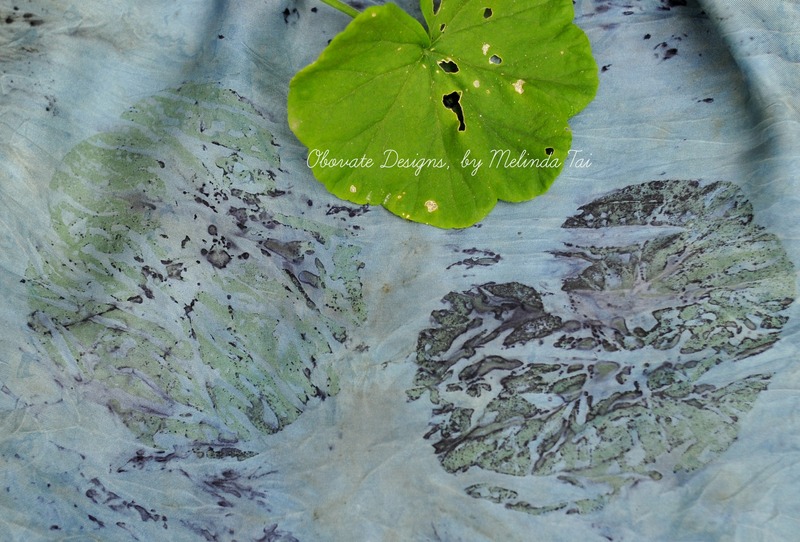 In this post, I am sharing with you a two-step process using a plain silk fabric that was first dyed blue in indigo vat dye; and then contact printed the dyed fabric with plant materials to create an interesting design and color. 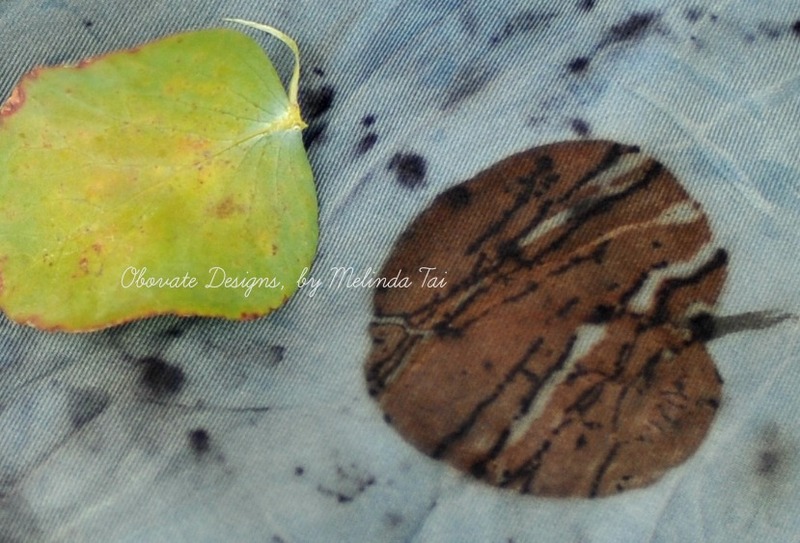 Indigo vat dyeing is an incredibly dyeing process! 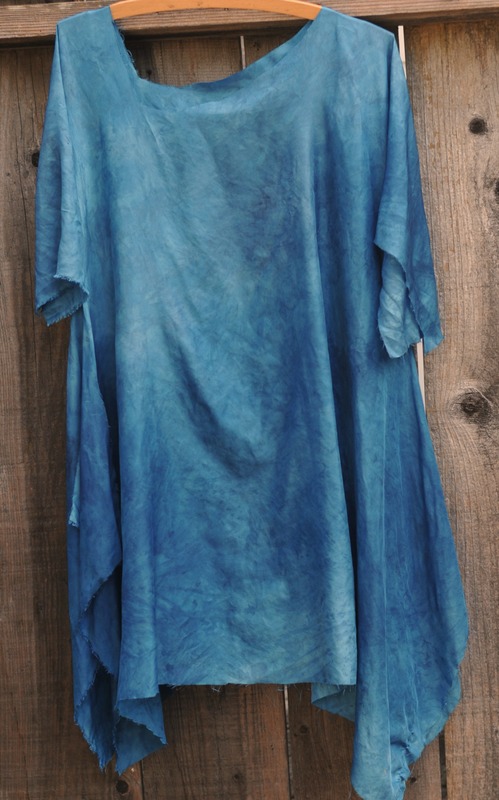 Just when the dyed fabric was removed from the vat dye, the dyeing solution oxidized from green to blue when the fabric was exposed to oxygen in the air. This was because the indigo dye molecule is soluble only in its reduced (oxygen-free) state when inside the vat; but when exposed to the air, the dye reduced back into insoluble form. This alchemy of nature happens instantly before your eyes–it is almost magic! 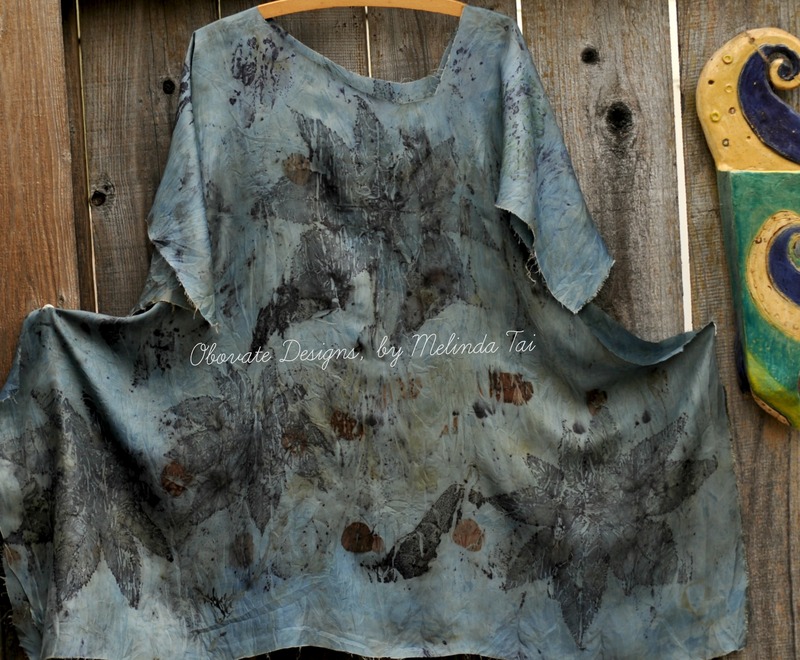 The result is a beautiful and permanent blue dyed fabric. 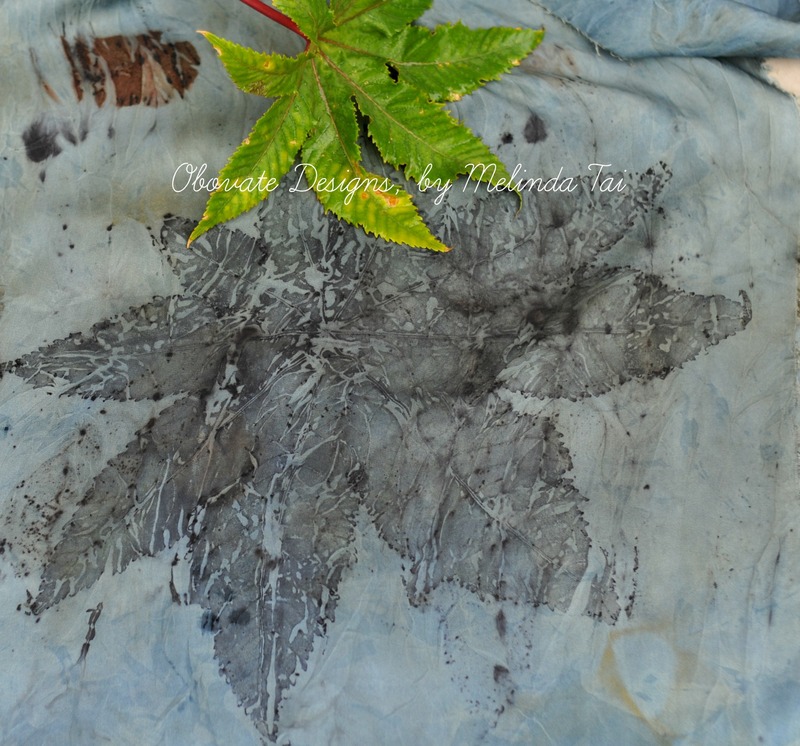 Next, I arranged the following plant materials: castor bean plant (Ricinus communis); geranium (Pelargonium); silver dollar tree (Eucalyptus cinerea) that were previously soaked in iron water in a random design onto the dyed fabric. Then the fabric and the plant materials were rolled up with a rusty iron pipe carefully and tied with strings before it was steamed for more than an hour. Here is the result after it was taken out from the dye pot. See the finished dress when I sew it together on my next post. dark and coppery outlines and leaf print was a result from the iron oxide from the rusty pipe that reacts with the tannin in the plant materials. close-up deep outline prints from large castor bean plant (Ricinus communis) and copper brownish orange from Eucalyptus cinerea. 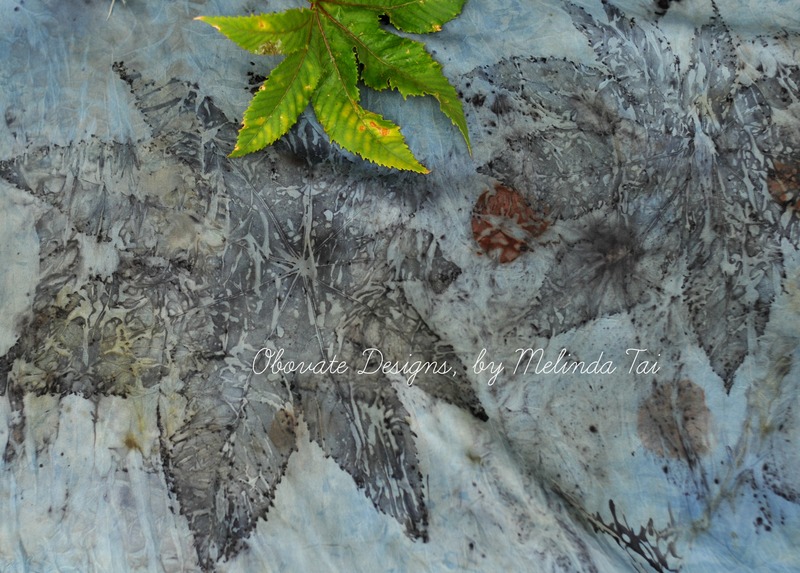 This entry was posted in dyeing, eco printing, wearable art and tagged alchemy of nature, before and after, blue, botanical, castor bean plant, eco-dyeing, eco-friendly, eucalyptus cinerea, geranium, indigo molecules, indigo vat dye, iron mordant, natural dyeing, Pelargonium, Ricinus communis, rusty objects, silk, silk twill, wearable art. Bookmark the permalink. Really nice result! You may oxidize the fabric also under running water. Lovely. I do mine the opposite way, ecoprint first and then indigo dip. Thanks Deb, I also tried both ways, depending on what I want to achieve. I love indigo and woad. You say steamed IN hot water. Was the fabric actually in the water or above it in the steam?